As I mentioned in last week's ICM newsletter article "How to minimize soil moisture loss," it is important to know your soil moisture status prior to working your field to select the best tillage management plan. Several methods can be used to evaluate soil moisture in the field for this purpose or for moisture evaluation during the growing season. These methods are simple, practical, and relatively fast. One method is hand feel and soil appearance. This method requires field experience in estimating soil moisture. A handful of soil is needed as instructed in Table 1 for each soil texture for each 1-foot soil-depth increment through the active root zone. The total amount depleted from all depths represents the amount of water that has been used by the crop. This method requires a hand soil probe to extract soil samples from each depth. It also requires some training and practice. A disadvantage of this method is that it might be less accurate than other methods. Soil texture plays an important role in this method, where the formation of soil shape, moisture traces left on the hand, and the consistency of the soil are significantly different among soil textures (Table 1). Knowing your soil texture and matching it with the soil textures in Table 1 can easily enable you to have a very good general idea about your soil moisture status. The values in Table 1 represent the readily available soil moisture (inch/1-foot soil depth) in the soil that the plant can use; the numbers in parentheses represent the moisture that has been already used by the plant of the total available soil moisture. A second method that is used with better accuracy than the previous method is gypsum blocks, sometimes called electric resistance blocks or moisture blocks. These blocks can be placed at several depths within the root zone. The blocks are installed permanently for one season and can be read with an electrical resistance meter, which can be used to determine the amount of water available at each depth. The photo shows a water marker and reading meter, which is another kind of gypsum block. To install the gypsum blocks, follow the manufacturer's recommendation. Generally, blocks should be soaked for at least 24 hours, dried, and wetted again just before installation to eliminate trapped air. Use a soil probe or auger for installing the blocks. Place the hole in the row and angle it toward the furrow. Place the shallow blocks at the edge of the furrow and put the deeper blocks under the center of the furrow. Installation of blocks is much easier with a small soil probe or auger. Insert the block in the hole by running the lead wire through the probe tip and by holding the block firmly against the probe tip with the wire. Make a slurry by mixing a small amount of soil and water and pour the slurry into the hole. Insert the block into the hole and press firmly to make sure the block makes good contact with soil at the bottom. Fill the hole 3 to 4 inches at a time, tamping the soil in the hole with a rod to make certain no voids are left so surface water does not move down to the block. 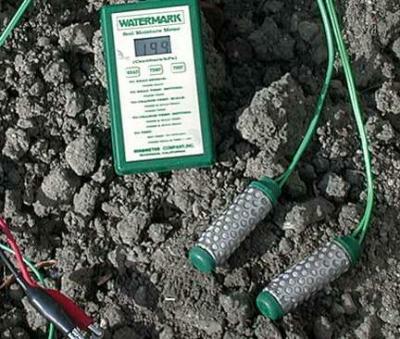 Stake the wire leads at the surface of the ground and identify each lead according to depth by color, knot, or flag. Installation must be done as soon as possible after the rows are marked by crop emergence to minimize root and crop damage. The number of blocks per station depends on the depth of the active root zone, which differs from one crop to another. As a rule of thumb, use one block per 1 foot of soil depth within the root zone. Generally, there should be at least four stations or locations for a set of blocks in each field. If the blocks are installed in a sloped field, stations should be located at the top, middle, and bottom of the field. Each station should be far enough from the top or bottom of the field, and generally 100-150 feet from either end of the field. Blocks should be located in representative areas of the field. Avoid low or high areas and changes in slopes. Choose a uniform plant population area. Try to keep the area around the blocks from compacting by approaching the station two to three rows away when taking moisture readings. You must know your soil type and soil water holding capacity to make full use of the data you get from the gypsum blocks. Therefore, gypsum block readings will reflect the available soil moisture of a certain soil texture or soil type. The advantages of using the gypsum block method to determine soil moisture are no soil sample is required, more frequent readings for the same field and the same location can be taken, and it saves time. Also, gypsum blocks enable you to check your soil moisture during the growing season and know the depth of soil that has been recharged from rainfall. However, accuracy is limited under saline and dry conditions. Accuracy requires gypsum blocks to have good contact with the soil. There are other methods that can be used for soil moisture evaluation. However, these methods are used in research and require training and are expensive. Monitoring soil moisture early in the season or during the growing season is important because soil moisture is one of most limiting factors in crop production. Alternative practices and field management then can be implemented to minimize risk. This article originally appeared on page 51 of the IC-484 (6) -- April 24, 2000 issue.